There is a disarming idealism at the heart of this inspirational tale told without frills of fancy. The flights of daring that the protagonist Naina Mathur undertakes never seems irrelevant. On many occasions I found the plot veering towards a sweeping sentimentality that, given other circumstances, would be considered manipulative. Hichki dives deep into the collective consciousness of a nation inured in prejudices and comes up with some well-served lessons on humanism tolerance and generosity. It may not be India’s To Sir With Love. But by Jove, Rani Mukerjee in what easily ranks as her career’s best performances (yes, better than Black) gives Mr Sidney Potier a run for his heroic stature. The plot derives its creative juices from a real-life British teacher who suffers from the Tourette Syndrome, a neurological disorder that causes painful verbal dysfunction in the sufferer. It’s astonishing how Rani takes over the sufferer’s role without allowing the disease to impede her character’s ingrained sunniness of countenance. When faced with a classroom filled with contumacious students from the slums (played by young actors who frequently act with representational emphasis) Rani’s Naina never falters, and never minds her tongue. It’s only when she is with her estranged father (Sachin Pilgoankar) that she loses her cool. Rani’s Naina’s two dining-table sequences with her screen-father are marvels of screenwriting drama, packaged and performed in pitch-perfect harmony. When the father’s patronizing sympathy gets too much Rani marches off to the kitchen to make rotis, venting her need to exhale in the kneading. It is the slum students who needed to be a little less soap operatic. In a film where the message is emblematized in gloriously lucid episodes, the ragged bunch of slumkids go too swiftly from rebellious to sweet-natured. Their changeover seems almost pre-ordained. Not that their abrupt character transformation takes away from the blithe reformatory mood and reined-in vivacity that shoots across the narrative with splendid sincerity. Not a moment in the storytelling is lost in humbug. Every minute counts. And while some of the scenes showing Rani’s flourishing bonding with her students is keenly melodramatic the actress sails above the stagnant pools of water that the plot often encounters. Rani Mukerjee makes her Tourette-inflicted character unwavering in her upbeatness and yet no giddyheaded breathless optimist. The pain comes gushing out in a sequence where she pounds and pummels her uncontrollable mouth almost as though she were sparring with her destiny. The astounding Neeraj Kabi as the cynical teacher who thinks slum is synonymous with scum keeps his character grey without getting into grime. What I liked about Rani’s Naina more than her textbook-perfect rapport with her students is her bonding with her mother (Sipriya Pilgaonkar) and brother (Husain Dalal). I wish there was more of them in the film. I wish there were more Naina Mathurs in this world who can teach all of us a thing or two about being human without making humanism a logo on a teeshirt. 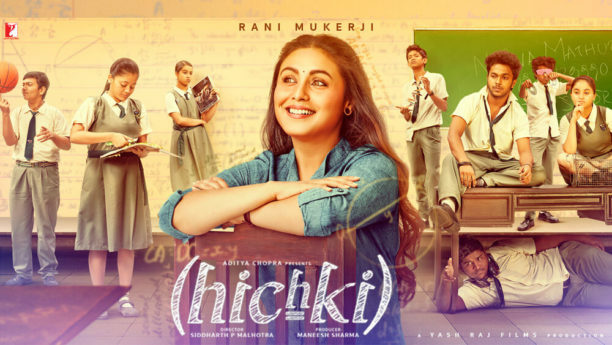 Hichki is a work of wondrous lightheartedness. Its absence of cynicism and its touching belief in the power of benevolence and generosity could get a wee overpowering for many of us who face brutal betrayals every day. But isn’t life in cinema all about alchemizing the pain and hurt into art? Hichki does that quite often and quite effectively. Cinematographer Avinash Arun fills the frames with hope and sunshine without killing the spirit of struggle that underlines every step of Naina’s journey. 15 queries in 0.376 seconds.